intending to magnify Allah, 4,000 sins are Erased. and the 7 words forgive the 7 ways one sins. 'La ilaha illa'llah, Muhammad rasulu'llah (There is no divinity but God, Muhammad is the Messenger of God) consists of twenty-four letters; the hours of the day and night are of the same number. It is as if it were said, "Every sin which I have committed, whether great or small, secretly or openly, accidentally or intentionally, by word or by deed during these hours is pardoned by these words". Also the phrase La ilaha illa'llah, Muhammad rasulu'llah consists of seven words. The servant has seven organs and hellfire has seven doors. Each of these seven words closes one of the seven doors to one of the seven organs. "La ilaha illallah" possesses secrets among which are the following: - All its letters are palatal (hurufuha jawfiyya), which is a subtle indication that to utter it is an act that proceeds from one's innermost, which is the heart. - None of its letters is dotted, a subtle indication of its freedom from any deity other than God. - It has twelve letters (l-a-i-la-ha-i-ll-a-a-l-la-h), which is the number of the months of the year, four of which are sacred, and that is the Name of Majesty (a-l-la-h).One letter stands alone (a), three are connected (l-la-h), and the four together are the best of the twelve, just as the sacred months are the best of the year: dhu al-Qi`da, dhu al-Hijja, al-Muharram, and Rajab (three of them consecutive, and Rajab standing alone). Each letter thus forgives the sins of an hour. - They are seven words in all, and the entrances to heaven are seven: each word thus blocks one entrance for the person who utters them. Ibn `Abbas said - may God be well pleased with him and his father - that the Prophet said: "The day God created the heavens and the earth He created an angel and ordered him to say: "There is no god except God alone" (LA ILAHA ILLALLAH). The angel lengthens his delivery as he utters it and will not rest from this until the trumpet is blown." 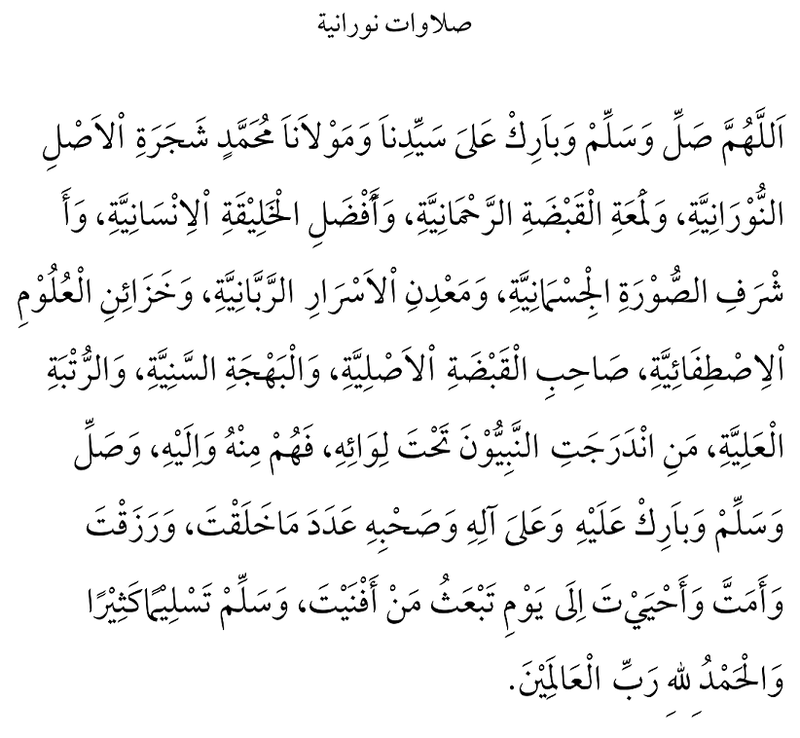 One of the Companions said that whoever says: "No god except God" and lengthens his pronunciation intending thereby to magnify God, God will forgive for him Four thousand grave sins with it, and if he did not commit Four thousand, God will forgive the difference for his family and neighbours. It is related in the hadith: "Whoever says "No god except God" and lengthens his pronunciation intending thereby to magnify God, Four thousand of his sins are astruck thereby from the register of his sins." Hence it is praiseworthy to lengthen one's pronunciation upon uttering it, as Nawawi said, may God the Exalted have mercy upon him. The Prophet also said: "Whoever lengthens his pronunciation upon saying "No god except God," God will make him dwell in Paradise in the Abode of Majesty by which he has named Himself when He said: "There remaineth but the countenance of thy Lord of Might and Glory" (55:27), and God will grant him to behold His gracious countenance." Whoever says "No god except God" in astonishment at something, God creates from each letter of his utterance a tree with as many leaves as the days of this world, each leaf asking forgiveness for him and praising God on his behalf until the Day of judgment."... It has been related that this phrase has on the side of Iblis the effect which a gangrenous sore would have on the side of a human being. God has created a pillar made of ruby and light whose foundation is the pillar beneath the seventh earth and whose top winds around the base of God's throne. Every time a servant of God says: "There is no god but God, Muhammad is the Messenger of God," the earth, (the whale), and the throne move and God says: "Be still!" and the throne replies, "By Thy might, not until you forgive the one who said "La ilaha illallah."" But God says: "Be still, for I have made a covenant with Myself before I created My creation, whereby I shall not cause it to be spoken by the tongue of a servant of Mine except that I have forgiven him even before he says it." Shaykh Hisham wrote in his "Angels Unveiled," in the chapter entitled "The Angel That Carries the Whale That Carries Creation": "In the beginning God Almighty in His majesty created a huge jewel of green peridot. No one but He knows its size. Then the Lord trained His gaze onto that jewel and looked on it with a glance of awe. Under the influence of God's gaze, this jewel became liquid and began to undulate. It turned into a sea and began to boil and churn and was moved from its depths. As it boiled, it began to evaporate, and steam rose up from it. This vapor continued to rise, and below it remained a thickening, coagulated, precious mass. After creating the heavens and the earth, God created a great angel. Between his eyebrows there is a distance of five hundred light-years. He has two wings decorated with great constellations. They spread their lights like flickering fires over his majestic shoulders. One wing represents the East, the other the West. The angel was ordered to bend down his neck. With both his arms he lifted up the whole of creation spanning the East and the West. He carried this burden until he came to rest right beneath the divine Throne. There he will remain until Judgment Day. When he lifted his burden, the angel saw that his feet remained suspended in mid-air. God then ordered the angels to bring from the highest Paradise a stone of red ruby. This heavenly rock was placed beneath the angle's feet so that he found a place for his feet. Now this red ruby remained suspended in mid-air. So the Lord brought an enormous ox which had seventy-thousand legs from Paradise. This ox was so huge that its horns reached from the highest heaven to the foot of the divine Throne. It was immeasurably greater in size than the angel carrying the heavens and the earth. The angels placed the red ruby stone between the horns of the ox where it was firmly grounded; except there was nothing to support the feet of the ox. God, therefore, fashioned a dome-shaped vessel; its breadth was a distance of seven hundred thousand light-years. The angels placed this vessel beneath the feet of the ox. The ox now stood firm. But the vessel was left hanging in the air. From the perfection of His divine power, God created a whale by the name of Lutia. He then ordered the angels to place the vessel on its back, and the angels obeyed. By the will of God, the vessel stood fast. Now only the whale remained in the air. So God created an angel more beautiful than the new crescent moon. Half of it is fire and half snow. Allahumma salli wa sallim wa baarik `ala Sayyidina wa Mawlana Muhammadin shajarati ’l-asli ’n-nooraaniyyati wa lam`atil qabdati ’r-rahmaaniyyati wa afdali ‘l-khaleeqati ’l-insaaniyyati wa ashrafi ’s-soorati ’l-jismaaniyyati wa m`adini ’l-asraari ‘r-rabbaniyyati wa khazaaini ’l-`uloomi ’l-istifaaiyyati, saahibi ’l-qabdati ’l-asliyya wa ’l-bahjati ’s-saniyya wa ’r-rutbati ’l-`aliyya, man indarajati ’n-nabiyyoona tahta liwaa’ihi, fahum minhu wa ilayhi, wa salli wa sallim wa baarik `alayhi wa `ala aalihi wa sahbihi `adada maa khalaqta wa razaqta wa amatta wa ahyayta ilaa yawmi tab`athu man afnayta wa sallim tasleeman katheera wa ‘l-hamdulillahi rabbi 'l-`alameen. O Allah! Bless, greet and sanctify our master and liegelord Muhammad, the Tree of Original Light, the Sparkle of the Handful of Divine Mercy, the Best of All Humankind, the Noblest of Physical Frames, the Vessel of the Lord’s Secrets and Storehouse of the Sciences of the Elect, the Possessor of the Original Divine Grasp, Resplendent Grace, and Uppermost Rank, under whose flag line up all the Prophets, so that they are from him and point to him. Bless, greet and sanctify him and his Family and Companions, to the number of all that You have ever created, sustained, caused to die, and caused to live again, to the Day You resurrect those You reduced to dust, and greet him with an abundant and endless greeting. Glory and praise belong to Allah, the Lord of the worlds!